Like cats, rabbits spend a huge amount of time grooming. Keeping clean is very important to their health. We can help our pets by grooming them regularly, and this is especially important when they are moulting. When rabbits groom themselves they swallow a lot of fur and if they swallow too much it can cause their gut to slow down, which can be dangerous. Unlike cats, rabbits cannot vomit, so it’s important to remove as much loose fur as possible. Ideally you should groom your rabbit every day. It’ll help you and your rabbit become better acquainted and at the same time give you the chance to check your rabbit for any problems – more on that later. 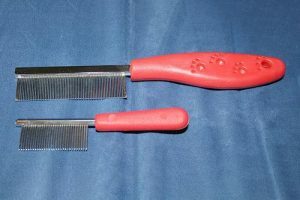 There are several tools on the market, made for cats and dogs, that are specifically for removing fur build-up during moulting. These are not suitable for rabbits. Their skin is much more delicate than that of a cat or a dog and is very easily torn. When rabbits are moulting the amount of fur they lose is significant. You can often see lines in their coat where dead fur has come out and the new coat is showing. The lines seem to travel along the rabbit’s body, generally from head to tail. 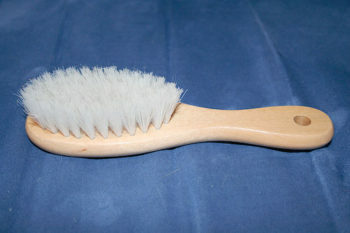 Rubber brushes or pimple mitts are very useful during moulting. They are fairly gentle but will remove the build-up of loose fur quite effectively. 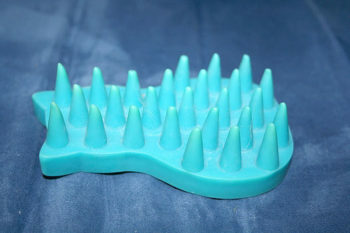 The rubber is quite soft but it still needs to be used carefully. 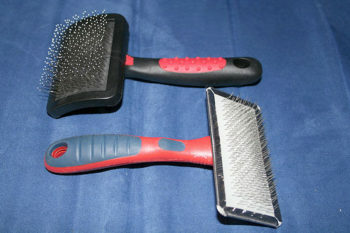 Soft brushes are great for general grooming, and many rabbits will enjoy sessions where they are used. 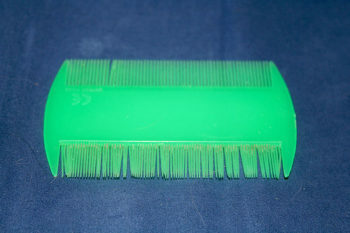 However, during a moult they need to be backed up with the use of something else. 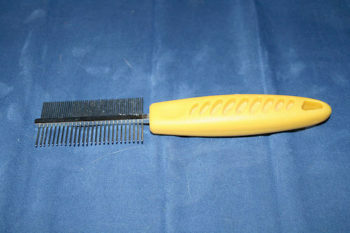 Combs are especially useful for longer-haired rabbits or when short coated rabbits are moulting. They must be used carefully to avoid injury. 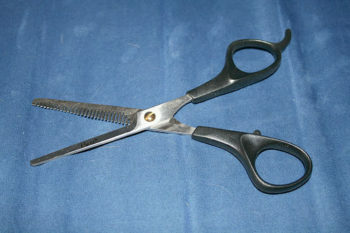 There is a page on this site devoted to nail clipping. 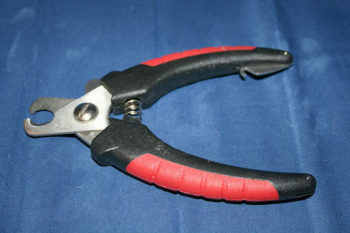 Nail clippers may be a scissor design or guillotine. The scissor type will have a notched section for the nail to fit into. 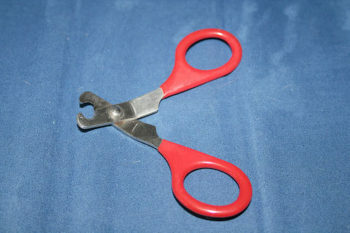 Please don’t use ordinary scissors or human nail clippers as these can split the nails and really hurt your rabbit. If your rabbit has any matted fur and you cannot gently brush the matt out, try untangling with your fingers, but be very careful not to tug on the fur as that can be very uncomfortable for your rabbit and may even cause injury to his skin. If this doesn’t work, you may need to cut the matt out. Be very careful, especially if it’s very close to the skin. If you are worried that it’s so close to the skin that cutting it might cause injury, ask your vet to clip the fur instead, using a clipper head that is appropriate for a rabbit’s fine fur. Some people when grooming will hold their rabbit on its back so it goes perfectly still as if in a trance. This is in fact extremely cruel as the rabbit is, in fact, terrified and playing dead as part of its prey animal response to being caught by a predator. Never do this to your rabbits. You can either hold your rabbit with it’s backside supported as if it is sitting up to cut the nails or place it on a towel on a worktop and very gently pull the foot to the side to get to the nails. 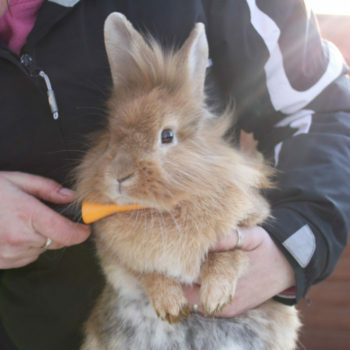 your rabbit’s body condition – not too fat nor too thin and with no lumps or bumps. If you do find lumps or bumps, any suggestion of flystrike, injuries, discharge from nose, ears or eyes, book a visit to see a rabbit-savvy vet. As a prey species, rabbits do not like to feel vulnerable, and a rabbit in water isn’t a natural position for them to be in. Even just getting them wet is problematic. When wet rabbit hair clumps together, getting them completely dry is a very difficult task, and rabbits who are left damp are potentially prone to respiratory infections and hypothermia.